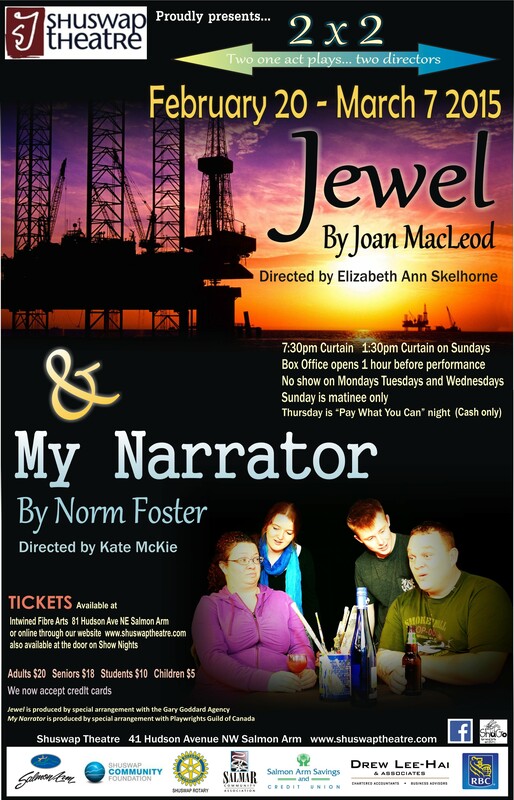 February 20 – March 7, 2015 Jewel by Joan MacLeod, Directed by Elizabeth Ann Skelhorne This powerful, one woman show is based on a real life catastrophe–the sinking of the Ocean Ranger oil rig off the coast of Newfoundland on Valentine’s Day, 1982. Three years later, widow Marjorie Clifford, at home in her trailer in Fort St. John, BC, begins to take the first step in understanding that the humanity of love, in all of its tentative frailty, uncertainty and promise, can free a life paralyzed and dominated by loss. 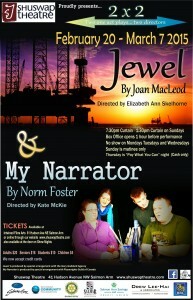 My Narrator by Norm Foster, Directed by Kate McKie Norm Foster does it again! Imagine what would happen if that little voice inside your head – the one that tells you how to behave and what choices to make – suddenly took on a life of its own? For Lacy and Miles, love is what happens, and with hilarious results. Jewel is presented buy special arrangement with Gary Goddard Agency. 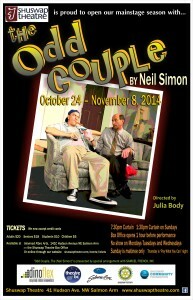 My Narrator is presented by special arrangement with the Playwrights Guild of Canada. 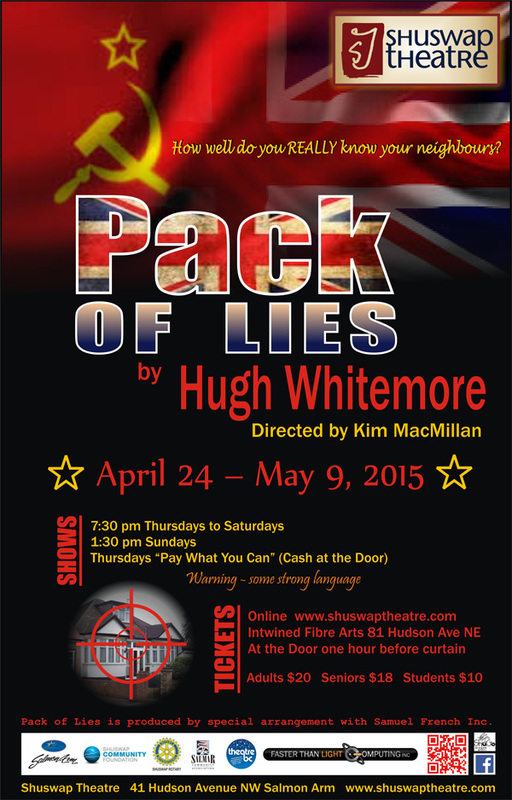 April 24 – May 9, 2015 By Hugh Whitemore, directed by Kim MacMillan. The Jacksons are a pleasant, middle aged English couple. Their best friends are their Canadian neighbours, the Krogers. All is blissful in their world until an agent (from MI5?) asks to use their teenaged daughter’s bedroom as an observation post to foil a Soviet spy ring operating in the area. The Jacksons become more and more distressed as the agent’s demands increase. 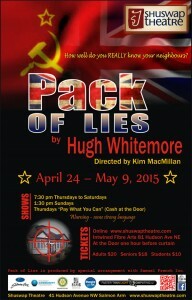 They are really put to the test when the agent reveals that the suspected spies are their closest friends. Should they betray their friends? Should they tell their daughter, who loves Auntie Helen and Uncle Peter? Is their whole friendship built on lies? Based on a true story. Presented by special arrangement with Samuel French, Inc. Important notice for those on our mailing list who buy tickets online. December 5 – 14, 2014 by Tina and Rob Burbidge, directed by Paul Kirkwood-Hackett Tickets: $12 Adults and Seniors, $5 Kids 12 and under, $25 Family (up to two adults and four kids). Presented by special arrangement with Lazy Bee Scripts. 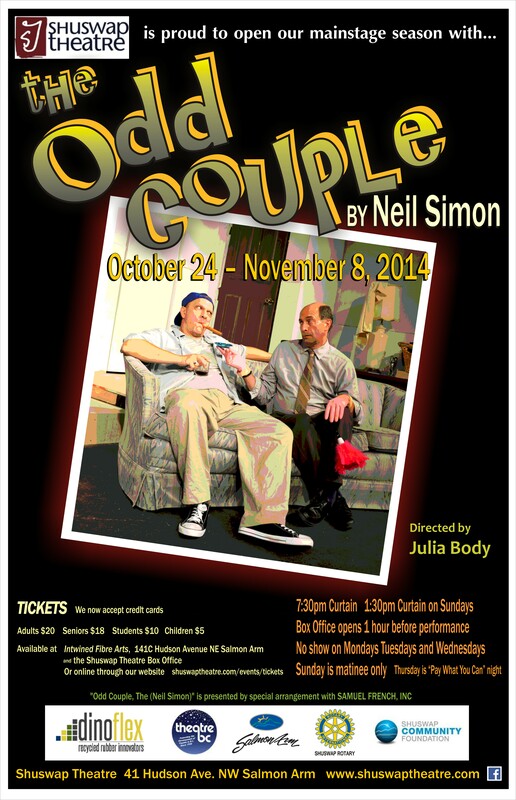 This hilarious comedy troupe will present 3 seasonal shows on Saturdays: Nov. 15, Mar. 14 and June 20. Beer and wine are served and it’s a fun adult night out. Tickets are $9 and will be available online (with a modest convenience fee), at Intwined Fibre Arts and at the door. Shuswap Theatre has formed a Youth Committee with a focus on nurturing the love of live theatre in young people! The goal is to have opportunities for youth to be involved in all aspects of a live theatre experience: acting, lighting, sound, costuming, set design and other backstage experiences. In order to promote youth enthusiasm, several events will be planned through out the year. First up is an Acting Intensive for youth – October 3rd and 4th with Aidan Sparks and Peter Blacklock. If you are interested in serving on the Youth Committee, please contact Shannon Hecker at 250-833-6001. Calendar of Theatre Events View the Public Calendar containing events of interest to the public. View the Members Calendar with details of rehearsals, production schedules, etc.